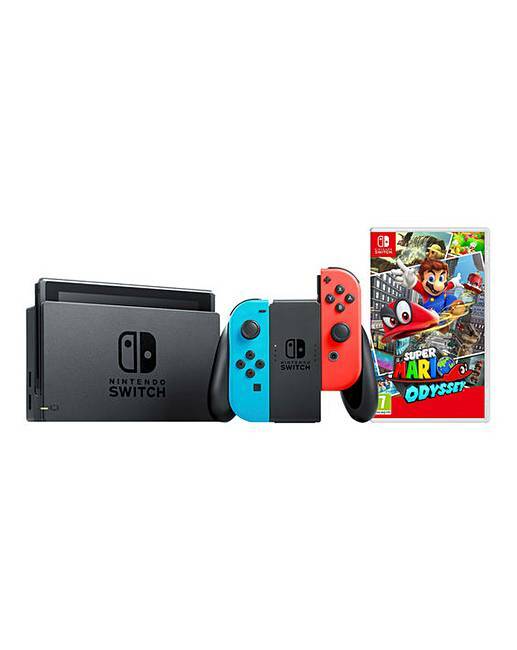 The Nintendo Switch is both an innovative and remarkable gaming console that can be played in the comfort of your home or transformed into a portable hand-held device to take the experience with you. The Nintendo Switch Neon Red/Neon Blue console maximises flexibility for gameplay. Choose to play in your home on the TV by popping the device in the dock with the handy Joy-Con controllers. Alternatively, you can take the games with you by slotting the Joy-Con controllers on to the tablet. Purchase this bundle and receive the Joy-Con controllers in the colours Neon Red and Neon Blue! It is a powerful home console and handheld device where you can play some of your favourite Nintendo games. Want to add a Player 2? Playing multiplayer has never been easier. Either pass one of the Neon Red/Neon Blue Joy-Con controllers to your friends or link up each of your consoles to create an intense multiplayer face-to-face competition of up to 8 players. The opportunities are endless! When you can easily take your games on the move with you, you can enjoy the full potential of the Nintendo Switch wherever you may be, with whoever and whenever. Purchase the Neon Red/Neon Blue Nintendo Switch to make a bold statement with this new powerful console. Includes Super Mario Odyssey- join Mario on a massive, globe-trotting 3D adventure and use his incredible new abilities to collect Moons so you can power up your airship, the Odyssey, and rescue Princess Peach from Bowser's wedding plans!